Carla M. Antonaccio is Professor of Archaeology Emerita in the Departments of Classical Studies and of Art, Art History and Visual Studies at Duke University, and has been Co-Director of the Morgantina Archaeological Project on Sicily since 1990. She was educated at Wellesley College and Princeton University, and has traveled and studied extensively in Italy, Greece, and elsewhere in Europe. Professor Antonaccio is the author of An Archaeology of Ancestors: Tomb Cult and Hero Cult in Early Greece; and co-editor of three books and numerous articles on Greek cult practice, trade and colonization, the excavations at Morgantina and their results, and on ethnicity and cultural identity in the ancient Mediterranean. 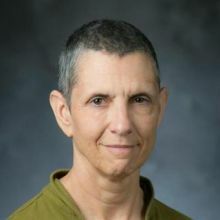 She has been a member and officer of the American School of Classical Studies and was Academic Trustee as well as Vice President for Research and Academic Affairs of the Archaeological Institute of America (AIA). Professor Antonaccio has lectured to many local AIA societies over the past 30 years and was the William A. McDonald lecturer in 2007.